I was born in Paterson New Jersey and grew up in the Small town of Midland Park New Jersey. As far back as I can remember politics has been a passion. I got my first practical experience when I worked for the election of President Gerald Ford at the age of 15 in 1976. Closely following the first Presidential debates since Kennedy/ Nixon I went on to write an article, my first, for the High School Newspaper titled "The Presidential Debates: A Personality Showcase." That issue was entered in the Columbia School of Journalism contest for school Newspapers and we were awarded second place. I had found a new passion and over time would marry it to the first. Upon graduating from High School I moved to Orlando Florida where I studied Radio, Television and Film production at the University of Central Florida. In 1988 as a member of the UCF College Republicans I attended the convention in New Orleans where I worked as a volunteer on the floor. I was standing less than 200 feet from Vice President Bush as he accepted the Party's nomination and uttered those now infamous words: "Read my lips, no new taxes." In 1990 I went to work for F/X Scenery and Display later FX Group a fabricator and designer of scenery for Broadcast News. In 1997 I entered the field of politics by running for the Orange County Commission and lost. In the process I learned about the inner workings of local politics both good and bad. I would later reap the benefits of this experience when as President of the Meadow Woods Home Owners Association I engaged in a five year battle with the Orange County Commission and multiple Developers for the construction of frontage roads adjacent to the 417 Beltway, a promise which had been made to our residents in exchange for allowing the Expressway Authority to put interchanges inside our development. They tried to renege by constructing retention ponds in the way of the original alignment and claiming them as "wetlands." After a grueling battle in which I was responsible for shutting down the entire County switchboard for three days as the result of over two thousand flyers which I paid for personally and had members of the Association distribute. One month later the County capitulated and voted unanimously in favor of the roads. In the end it cost the County and the Developers triple the proposed expenditure of the original alignment as the roads now required two fly overs of the Sunshine State Parkway. 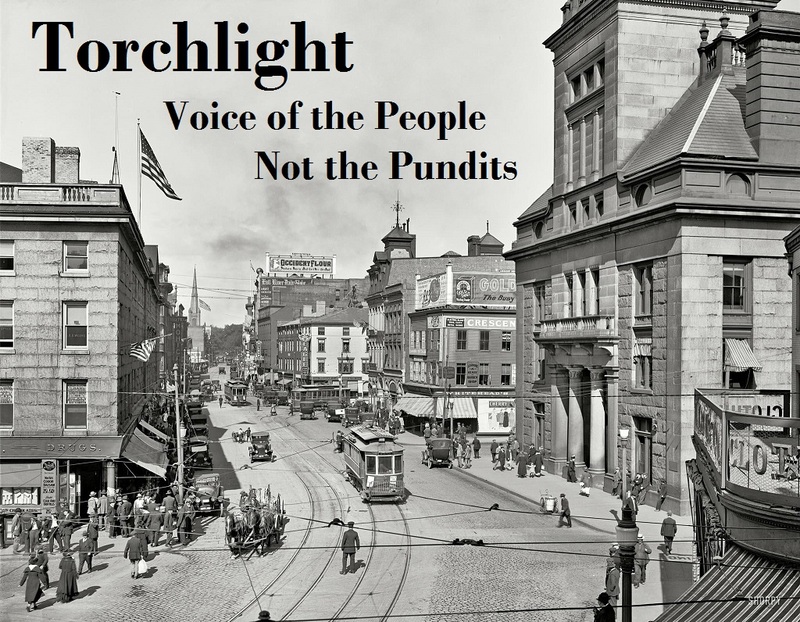 In 2008 I returned to writing and started a political Blog called "Torchlight." It held the number one position in the State of Florida for nearly a year. By following the election results from the Secretary of State's offices in Florida and Ohio in key counties I was able to call the election for Barack Obama two hours ahead of the Networks on the Torchlight Blog. While it wasn't the call I wanted to make I am proud of the achievement none the less. Torchlight and later Torchlight 2 migrated to the "Townhall.com." Blogosphere now defunct. In 2010 I began writing a political column for The Examiner which was later absorbed by a media conglomerate and closed. I am very proud to revive Torchlight now Torchlight Voice of the People with a good friend and a fellow Alumnus of Midland Park High, Alex Cirulis. We are proud to bring a new twist to the Blogosphere by offering not only opinion but opinion based on first hand experience in the articles categorized under "Real People:Real Experiences. War and Revolution is coming though the Elites have failed to recognize it. Schumer and Pelosi signal support for open Borders. Contact Congress now to stop them! It’s your Government, make your voices heard! If he’s White burn down the Town. If he’s Black don’t look back. We’re under Attack, and it’s time for You to Act!